位置：首尔特别市中区世宗大路110(太平路1街)活动地点：首尔广场 联系电话：dasan客服中心120 网址: http://www.seoulphil.or.kr/perform/concert/detail.do主办单位:首尔特别市/财团法人首尔市立交响乐团 Tel.dasan客服中心120 活动简介：作为代表首尔的光复节文化活动,通过最高级别的演出和节目,市民们可以享受高品位文化。 … More 2018年8月首尔庆典及活动,展览会!!! 瑞来村名字据说是由村子前面的小溪潺潺流淌而得~ 由于没有高楼大厦，能看见蓝天白云，感觉特别棒！居住在韩国的法国人中大约有一半左右 ，据说居住在瑞来村~法国人在这里落户, 据说是从1985年位于龙山区汉南洞的法国大使馆学校 … More [推荐瑞草名所]首尔的小法兰西瑞来村!!! [Recommended place to visit in Seocho] little France in Seoul ‘Seorae Village’ !!! the name is originated from flowing in the stream in front of the village. There is no sky buildings. I’m so happy to look up to the clean sky. This village is the place where majority of the French in the country lives. … More [Recommended place to visit in Seocho] little France in Seoul ‘Seorae Village’ !!! 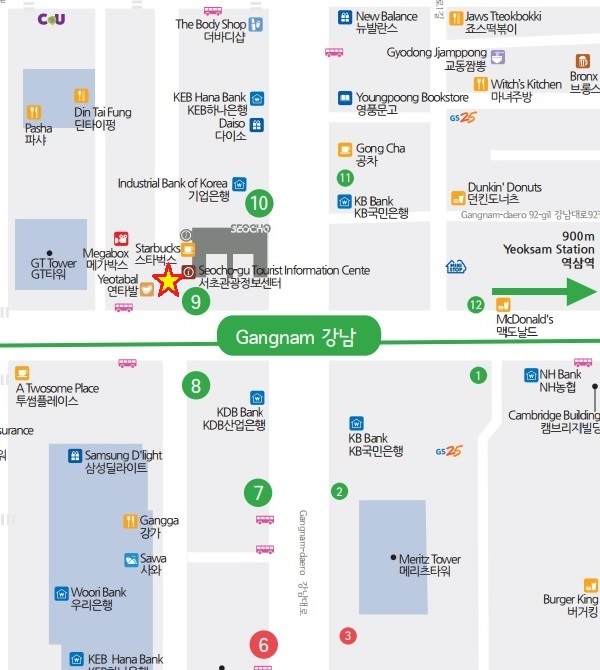 Leave a comment [Recommended place to visit in Seocho] little France in Seoul ‘Seorae Village’ !!! 안녕하세요 ~ 서초관광정보센터 입니다 오늘은, 시리아에서 오신 예쁜 분들이 방문해주셨습니다 Hello ~ Seocho Tourist Information Center ! Today, the two beautiful ladies visited to here. 您好~我是瑞草旅游信息中心. 今天,来自叙利亚的各位来宾来访. [서초 가볼 만한 곳 추천] 서울 속의 작은 프랑스 서래마을!!! 서래마을 이라는 명칭은 마을 앞의 개울이 서리서리 굽이쳐 흐른 것에서 유래했다고 합니다~ 높은 빌딩이 없어서 푸른하늘이 보여서 너무 좋습니다~ 대한민국 거주 프랑스인 중에서 약 절반 정도가 서래마을에 거주하고 있다고 합니다~ 프랑스인들이 이곳에 터를 잡은 것은 … More [서초 가볼 만한 곳 추천] 서울 속의 작은 프랑스 서래마을!!! Leave a comment [서초 가볼 만한 곳 추천] 서울 속의 작은 프랑스 서래마을!! !